An amazing Hostel in a perfect Location! The staff is awesome and the bar is the perfect start for a great night out! This hostel is one of the best hostels I've ever stayed in. The rooms are clean, the staff is super friendly and helpful and most important it has a really good atmosphere. You can easily connect with people at the bar which closes at 11 pm so it's not too loud. I would always come back!! 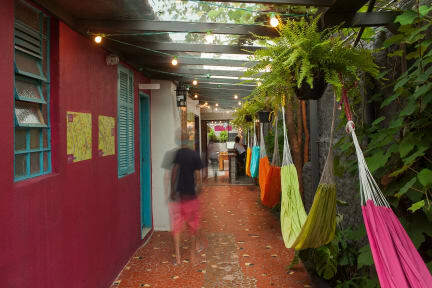 I stayed in this hostel twice on our trip through Brazil and absolutely loved it! The location in Vila Madalina is perfect and the staff is amazing. They made our stay even better than it already was. Especially Estefan, Mariana, Pedro, Oliver, Daniel, Roger and all the others as well. Would definetely recommend everyone coming to Sao Paulo to stay here! It's even popular among guests from outside who just come and hang out at the hostel bar and sometimes celebrate their bdays. Eine super Crew welche das Hostel führt. Wir haben ein Zimmer gemietet und uns an der Bar verköstigen lassen. Die Tapiocas simd einfach wunderbar. I really had a beautiful stay for almost a week that leaves me with nothing to complain about. The staff is amazing, helpful, happy and come by to hang out even if they have a day off. That should speak for itself. Big thanks! Nettes, geselliges Hostel inmitten von junger Bar- und Restaurantgegend. Die Hostelbar selbst ist immer gut gefüllt und sehr gesellig! Toiletten sind vier für alle (in den dorms) und deswegen oft semisauber, aber okay. Mitarbeiter*innen sehr freundlich und hilfsbereit!